The Video Lecture includes explanations and problem-solving exercises, along with frequent example questions similar to what you may see on the exam. This 8-hour video lecture goes over basic knowledge you will encounter on the exam. The videos can be watched on-demand for 180 days. 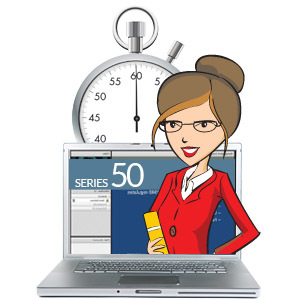 The Series 50 Video Lecture is viewed through our website and can be accessed via computer, tablet, or mobile device. I was very apprehensive about the Series 24 exam prior to taking it. Everyone I knew who had taken it informed me that it was an incredibly difficult test, with questions that were meant to trick you. After following Solomon's six week study outline and making flashcards for my weakest areas, I was averaging in the high 80s on the Solomon practice exams. That gave me the confidence I needed to walk into the test center feeling prepared, and the knowledge I needed to walk out of the test center having scored an 88. I am now recommending the Solomon Series 24 materials to everyone at the office!